Starship - To Boldly Go...: We're in Cabo! We made it to Cabo San Lucas! 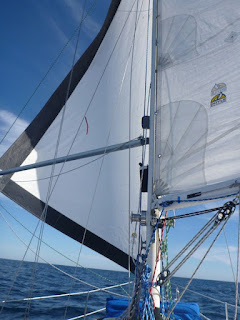 The wind was super light and in the wrong direction when we were trying to make our way to Ensenada, so we decided to sail straight to Cabo. Why not? It’s only an extra 750 nm ;) Well it took us 850 nm and 8 days, but we made it. Woo Hoo! It was definitely our longest voyage yet! I’m very proud of us for making it this far and happy to report that we didn’t break anything this trip. 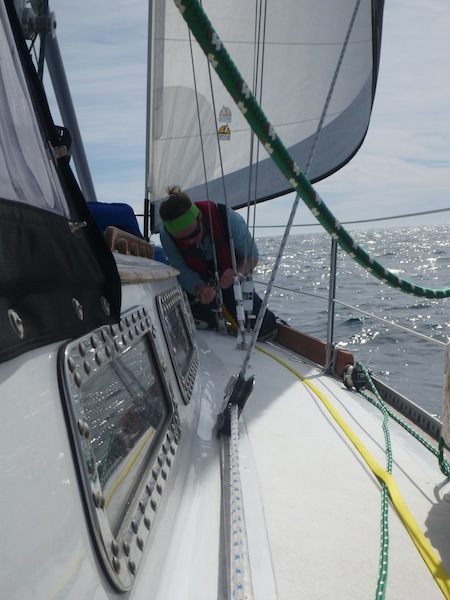 We even did a few boat projects underway like …..
…tightened our forward lower stay. It is a complete mystery to me as how it got loose in the first place. 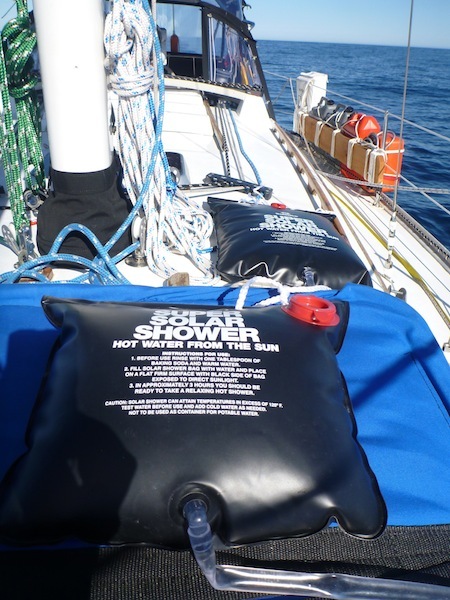 ….showering under way using our awesome solar showers. We would get wet, soap and rinse using salt water (using the big solar shower bag) and then do a final fresh water rinse (using the small shower bag). It worked out really well. 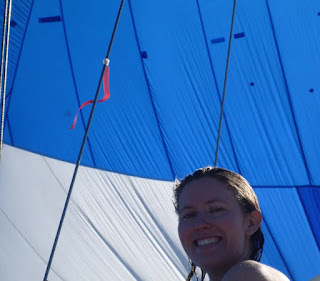 Showering on the boat was glorious and I always felt like a new woman afterwards! We were also treated to another beautiful array of sunsets and sunrises! They were breathtaking. 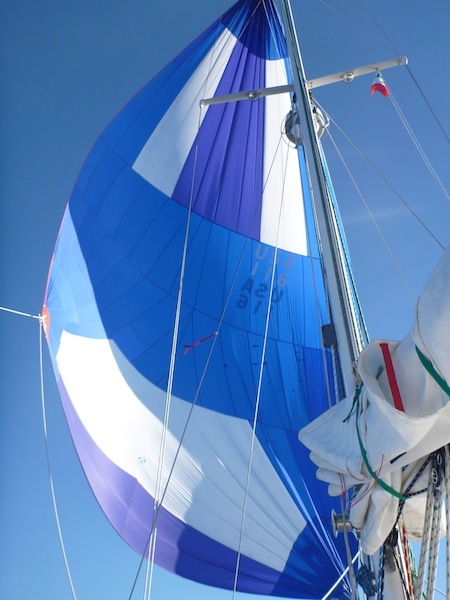 The winds were pretty light and at our back, so we usually flew the spinnaker or sailed wing on wing with the jib poled out. One of the most exciting parts of the trip was to see the degrees of latitude continually decrease on our GPS monitor as we continued to shed layers of clothing. The weather was amazing! 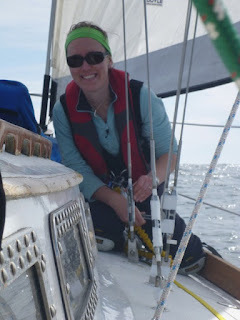 Our shift schedule worked out pretty well…but it was tiring only have 2 people on board. We missed you Kyle! I only realized how truly exhausted I was when we set our anchor in Cabo and I slept for 12 hours straight. Here was a typical 24-hour period on Starship. 7 am – 5pm: Chris would usually make us breakfast. I was treated to eggs, pancakes, french toast…He even took orders in the evening. I know I’m a lucky girl. Chris would usually nap for an hour or so in the morning and I would usually nap in the afternoon. Some nights on watch it was really easy to stay up, and some nights it felt like torture. I am so thankful for the CBC and NPR podcasts I downloaded before leaving San Diego. They were lifesavers. The night shifts became progressively harder as the days went on. 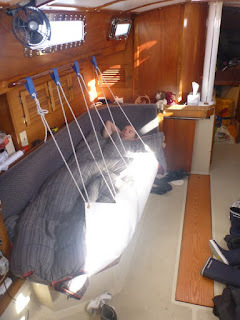 There always seemed to be something to do on the boat during the day, so we didn’t always take the naps, which resulted in some serious sleep deprivation. Next time we need to make sure we get at least another hour or two of sleep during the day. We arrived in Cabo to a spectacular sunrise and the first thing we did after setting the anchor was jump in the water. We are super happy to be here and can’t wait to explore Mexico! P.S. Very minimal seasickness during this trip!